After seeing Bruce Springsteen playing in Glasgow last night I want to write a wee quick review of his concert. Also I am in the lucky position of having seen him twice on the current tour. I wrote about his concert in Sunderland almost exactly a year ago, when he first came to the UK on the Wrecking Ball tour. So I feel I have had the chance to see how he plays different gigs, different shows to different crowds. I have never really thought of myself as being a groupie of Bruce Springsteen but when I was listening to some of his old albums in the lead up to this gig I was aware not only of how much I liked them, but also how well I knew them. Born in the USA was released when I was 13 years old and was bought by my mum. I liked it and it kind of drifted into my record pile as time went on, along with her Specials album and Zenyatta Mondatta, by The Police. When I was in fifth year at school and at Glasgow University I would browse the various record shops of the west end religiously every single Saturday. You had a fair amount of choice with West End Records in Clydebank and on Dumbarton Road at Partick, the wee second hand shop on Downhill Street opposite the Dowanhill pub (Realistic Records?). There were the two strange brothers with wispy comb-overs that ran the chaotic shop on Byres Road opposite the subway (was it called Echo? ), the one on Park Road for weirder stuff, then Lost In Music in Decourcy's Arcade for a lot of independent Scottish stuff, Woolworths on Byres Road was good for 12 inch singles. Later came Stephen Pastel's record shop upstairs in John Smith's bookshop, beside the subway (still on the go as Monorail in town). That combined with HMV, Virgin and Tower in town and my Britannia Music subscription meant that there were plenty of ways to pick up Brucie's back catalogue, usually quite cheaply as most of these shops had big second hand sections. So I worked my way through all his old stuff, got the 5 album live box set (Live 1975/85), a few 12 inch records and picture discs. I had my Clarence Clemons and the Red Bank Rockers album on cassette (which I'm REALLY annoyed I threw out when I got rid of my tape deck - I used to drive about in my Ford Fiesta with "Resurrection Shuffle" blasting away on many a night). However whilst I was playing his old stuff repeatedly, his new stuff seemed a bit anaemic in comparison. Tunnel of Love I bought but found it a bit too slick and overproduced. 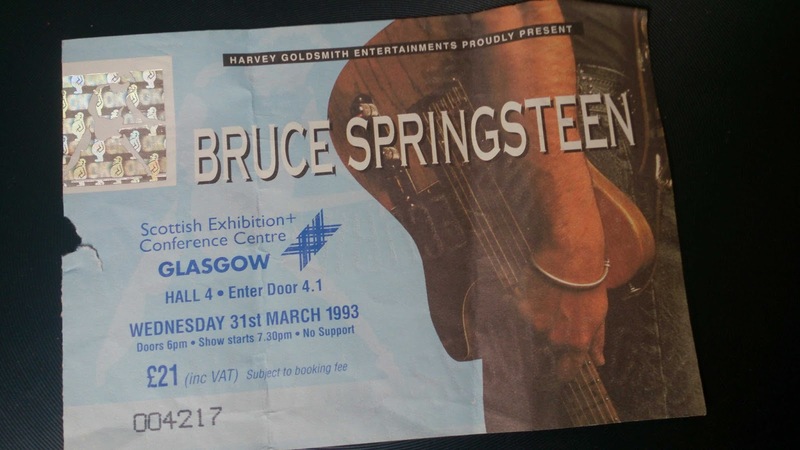 When the albums Lucky Town and Human Touch came out I only bought a few of the singles but took the chance to see him live at the legendary atmosphere dampener that is the SECC in Glasgow in 1993. After spending £21 for the ticket I then won 2 tickets in the Daily Record - it never happens when you really need one. He had recently split from the E Street band, didn't seem to engage with the crowd. It was a disappointing night and I lost interest in what he was up to after that. After that I bought some of the compilations of demo versions and studio tracks that never made it to his earlier albums, things like the 4CD box set "Tracks" and the later double CD "The Promise". This was stuff that I liked and had a connection with and also the "The Ghost of Tom Joad" album seemed to hint that there was life in the old dog yet. Although I didn't buy it at the time, "The Rising" won plaudits for his songwriting managing to connect with a lot of Americans and New Yorkers traumatised by the World Trade Centre attacks. It was also his first studio album with the E Street Band for 18 years. Once he brought out the "Seeger Sessions" albums I bought back into Bruce Springsteen, playing music I knew from my parents Weavers albums and songs I was sung as a child, but delivered with a grin and a stomping energy that seemed to have been lost for a while. Wrecking Ball in 2012 delivered one of his finest albums ever. It is bizarre that some early American reviews described tracks such as "We Take Care Of Our Own" as jingositic. Did they not hear the anger, mocking the response to Hurricane Katrina? It had echoes of Reagan using Born In The USA, missing the point of the song completely because it had a stars and stripes on the cover of the album. So when he returned to Britain I headed to what I thought would be my nearest gig, Sunderland, 12 months ago. In incessant drizzle he delivered a 3 hour long, high energy performance. I was in the standing area, though not in the expensive, wristbanded pit, and was surprised that so few people around me knew anything more than the big hits. A few were bamboozled by the Clarence Clemons tribute, unaware who the "Big Man" was never mind that he'd recently died. I wrote about it at the time, so I won't go over it again. Here is the setlist that night (I think). So a year later we fought our way through the traffic to reach Hampden. As usual he was on stage by 7.30pm with no support act. 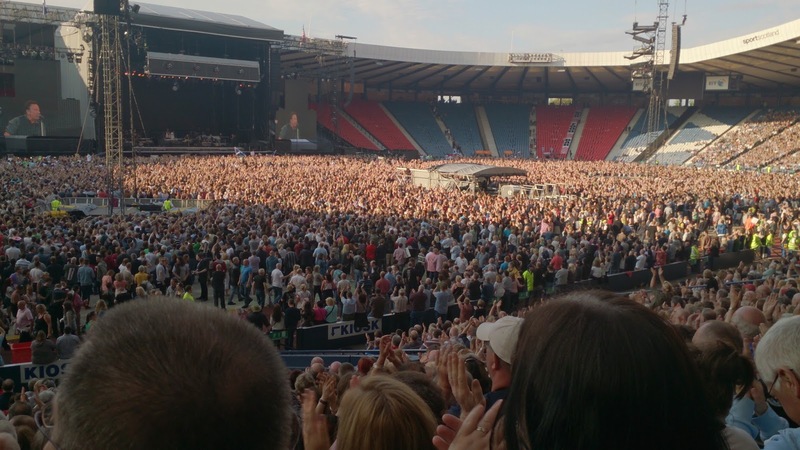 Hampden was more crowded than The Stadium of Light concert had been, and from the off the crowd were 100 times more lively and engaged. An unexpected sunny Glasgow evening probably helped. Here is the set list from last night (again, I think). From looking at no more than the set list you can see that he is putting on a different show each night. In Glasgow he spent more time taking requests from the boards people offered up, seemed to be more relaxed and playing what he fancied, what he thought the atmosphere called for. The crowd in Glasgow was warmer, more in tune with what he was doing on stage, clocking songs from the first drum beat or guitar chord. A crowd that is more clued up about his back catalogue seems to get offered up the more obscure early album tracks that I like so much. The Wrecking Ball tracks still stand up with the rest as great songs, great live songs. The extra encore, playing a solo version with the acoustic guitar of Thunder Road, felt like after over 3 hours 45 minutes he still couldn't drag himself away from something he enjoyed doing. For all the free and easy plucking of random songs, when he threw one at the band and they got the intro a bit off, he was quick to stop them and get them to do it right. Later when a stray sax toot trod on a false ending of a song, the tooter was noted by the Boss. He is their Boss, he clearly runs a tight ship and looks for the musicians to get it right every night. 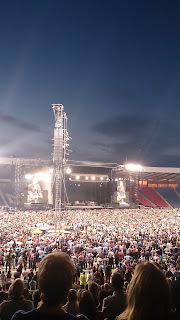 Despite sitting at the other side of a stadium from the band last night, it felt much more intimate and connected than when I was standing at the foot of the stage 20 years ago in the SECC. It was a barnstorming performance. He is a fantastic showman and at the moment nobody else does it like this. Being a Jags fan and also a Springsteen fan (was at Sunderland too) I really enjoy reading your blog. This is another excellent read. Just one issue to raise. The pit area at Springsteen gigs is not charged for, it's available to those that queue earliest for each gig. You are clearly a man of taste. I didn't know that about the pit area, thanks for correcting me. Can you remember what song the band got wrong ??? Sorry, can't remember now. It was about 2/3 through the set but looking at those songs it's not coming back to me. Cheers anyway. Good blog by the way.